With the trail from Oklahoma to Nashville blazed by icons like Garth Brooks, Vince Gill, Toby Keith and Blake Shelton, upstart country artists claiming roots in the Sooner State have a helluva lot to live up to. Only time will tell just how much Shane Wyatt (www.shanewyatt.com) will add to the lore of legendary Okies who struck gold in Music City, but the multi-talented singer/songwriter and lifelong fiddle player is already staking a pretty good claim, riding high and wild on the initial success of his independent debut album The Last Cowboy. Touching hearts and scooting boots with songs inspired equally by modern traditionalists like George Strait and contemporary country rocker Jason Aldean, Wyatt is enjoying great grass roots success with his first single, “The Big Bad Dog,” a hard driving yet heartfelt tribute to a nasty looking, speed limit busting vehicle his uncle once drove. The track has been played on major stations in (naturally) Oklahoma, Nebraska, South Dakota and Minnesota, Wyatt’s adopted home state where he and his band have become a regional sensation stirring up dust in clubs, honkytonks, rodeo post shows and on the festival circuit. Among his upcoming high profile gigs is Firefest 2008 with superstar Joe Nichols (“Tequila Makes Her Clothes Fall Off”) in Cold Spring, Minnesota, which raises money for local firefighters. Wyatt will be taking “The Big Bad Dog” across the U.S. with its inclusion on a CDX subscription disc (volume 452, released July 7 th ) that goes out to over 2,000 country stations nationwide. But major airplay can only take a guy with this perfect combination of humility and swagger so far. The first real step in becoming a country star is getting a big time line dance created around your song, and the infectious steps created around “The Big Bad Dog” by Nashville’s famed Jamie Marshall —creator of the dance sensations around “Bomshel Stomp” and Big & Rich‘s “Save A Horse, Ride A Cowboy” —are quickly inspiring a craze in dance clubs around the country. Wyatt’s incredible breakthroughs to this point should inspire a lot of other indie artists who wonder if simple persistence—backed of course by relentless, can’t be denied talent—is enough to take their careers to the next level. A huge fan of Aldean’s 2007 hit album Relentless, the singer boldly contacted its producer Michael Knox, in turn hooked him up with Mike Noble, the studio coordinator for the Aldean project and a major player in Music City whose songs have been recorded by everyone from George Jones and Kenny Rogers to Brooks & Dunn and Restless Heart . In producing The Last Cowboy, Noble brought in some of Nashville’s top “session cats,” including drummer Shawn Fichter (Trisha Yearwood, Peter Frampton), bassist Jimmy Carter (Dierks Bentley, Tim McGraw), guitarist Mike Durham (McGraw, Dave Matthews), fiddler Glen Duncan (Shania Twain, Kenny Chesney), pedal steel guitarist Russ Pahl (Rascal Flatts, Trace Adkins) and backing vocalist Thom Flora (George Strait). These include the high spirited, whimsical observational tune “Princess,” which cleverly talks about whiskey being the fail safe, “girl” in the life of a man who has known too much real life heartbreak; the edgy, heartfelt power ballad “Waiting For Forever,” which he wrote optimistically for his wife when the two were dating; and the poignant “Just Married,” about couples who stay hitched and try to put on their best faces even after the passion is long gone. 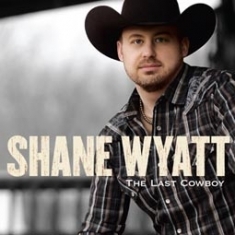 Beyond the Oklahoma pedigree, Wyatt shares a key musical influence with Garth Brooks—an appreciation for the late great Grammy nominated singer-songwriter Chris LeDoux, a former rodeo champion who recorded 36 albums (many self-released) and sold over six million units over the course of 30 years. He shot to national prominence when Brooks mentioned him in his song “Much Too Young (To Feel This Damn Old”) , and years later Brooks offered to donate part of his liver to LeDoux when the singer needed a transplant. Trained by the legendary Benny Kubiak, Wyatt started playing the fiddle in local talent contests at the age of 10; within a few years, he was renowned in the area around his hometown for his fiddle playing in various local country bands and bluegrass groups. As a teenager, he picked up the guitar, started writing his own songs and his musical style began to flourish. He alternated his style, playing in bluegrass festivals as well as run-down honky-tonks, often sneaking in the back door to avoid getting busted for being under age. Like a lot of young performers who choose to play it safe rather than go after their dreams early on, Wyatt ran from his destiny for a number of years, choosing to get a more practical degree and building a career as in the business world. Wyatt’s fans can thank his wife for encouraging him to do what he always should have been doing in the first place—writing, singing and performing live. He honed his singing chops with the help of a vocal coach and developed his sense of songwriting irony with his studies at the Brave New Workshop, the longest running satirical theatre in the country specializing in teaching the art of improvisation.